The Hallmark Channel is sticking with Good Witch. Today, the network announced they’ve renewed the series for a third season. Currently in its second season, the light drama stars Catherine Bell, Bailee Madison, and James Denton. So far, season two has received low-but-decent ratings for a cable series, earning an average of .24 in the 18-49 demo and 2.184 million viewers. The season two finale of Good Witch airs on June 19th at 9 p.m. ET/PT. STUDIO CITY, CA – June 2, 2016 – Hallmark Channel today announced that the hit original series “Good Witch” will return for a third season. “Good Witch” is currently airing Sundays at 9pm ET/PT with the season two finale scheduled for June 19, 2016. Production on 12 episodes for season three is scheduled to commence August in Toronto for a 2017 premiere, including an all-new Halloween special to air October 2016. Through the first seven episodes, season 2 of “Good Witch” is averaging a solid 2.3 HH rating and 2.5 million total viewers in L+3, making Hallmark Channel the #3 top rated cable network in the time period. This is the second original series pick-up for Hallmark Channel in recent months, having also confirmed a fourth season for its frontier drama “When Calls the Heart.” The series is a social media phenomenon with its loyal #Hearties fans, and averaged a 2.3 HH rating and 2.6 million total viewers in Live +3 for its third season. Hallmark Channel will continue to present original series on Sunday nights this year, with the much anticipated series premiere of “Chesapeake Shores” starring Jesse Metcalfe, Meghan Ory, Treat Williams and Diane Ladd on August 14 at 9pm ET/PT. 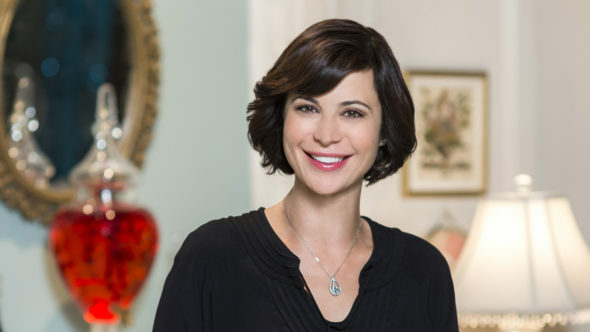 “Good Witch” stars Catherine Bell (“Army Wives, “JAG”), Bailee Madison (“Just Go With It,” “The Fosters”) and Golden Globe(R) Award and two-time Screen Actors Guild Award winner James Denton (“Desperate Housewives”). The weekly series takes viewers on a magical journey with Cassie Nightingale (Bell) and her bright, teenage daughter Grace (Madison), who shares her mom’s special intuitive charm. Sam (Denton), a doctor, and his teenage son live next door, and are charmed by the “magical” mother-daughter duo and wonder is it really magic, a lucky coincidence or just a special intuitive insight only this family possesses? Based on one of the network’s most successful original movie franchises of all time, “Good Witch” inspires with each intriguing episode set in the quaint fictional town of Middleton. What do you think? Are you a fan of Good Witch? Are you glad it’s been renewed? I am a big fan of Hallmark and Good Witch it’s spell binding love the cast, the writers. Good clean entertainment that the movie industry lacks. I don’t know how the actors feel but I would love to see Good Witch go down as the longest tv series in history. How about 10 years. Most enjoyable to watch, family show and it is not a reality tv show. I can’t tell you how much I love the Good Witch! I watch it and I get lost into its world and I can’t wait for the next show to start. I hope that if they are introducing a man for Abigail and friend for Grace it will go into a fourth season. Please don’t rush the romance of Cassie and Sam I love the pace they are going at now!! Good Witch has become my favorite series. Its light, romantic, and upbeat and totally different from anything else on tv. Love it !!! I love the show. I’m so happy it was renewed for a third season! I have described this program as a “feel good” show and will continue watching it for as long as it is there. Keep it coming!! !